My third Bettine dress has flown into the wardrobe this week. I have made both a cotton one of theses with all the trimmings - pockets, sleeve tabs and facings - and a simpler jersey one. I much prefer wearing the jersey one. I hardly wore the cotton one, it felt a bit restricting so I decided to recycle the cotton dress and make another jersey one. The fabric is from Sherwood fabrics which I bought last year. A great quality viscose jersey but thick enough for a dress with a good drape. I used the neck binding technique (as outlined on my left side bar)to finish the neck edge - a winner every time. Bloke bought me the propelling chalk pencil for Christmas which is totally brilliant and comes with a range of different coloured chalks. It is the best dressmaking chalk I have used because it does not drag the fabric;it marks it. He bought it from Amazon but I don't have a link because I don't want to know how much they cost! This is the perfect dress for all season work wear. In the Winter with tights, shoes and a cardigan and then on its own in the Spring. Black is not a colour I wear in the Summer but my other one will be out in force by then. 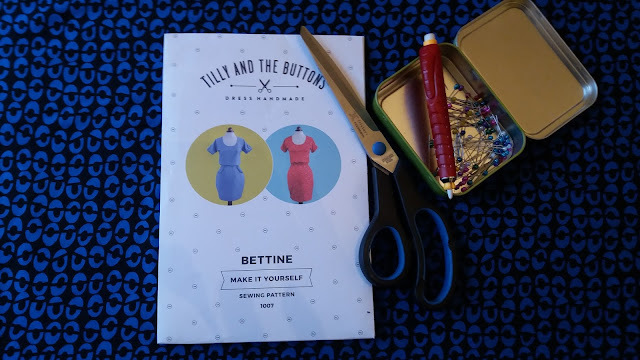 I have had a bit of a cull lately which meant putting a load of Boden clothes on ebay and pocketing the cash as I replace my wardrobe with handmade! Love this dress! The fabric is awesome!! This looks great! I like the fact you made it in jersey - did you need to alter the pattern at all? Not in sizing. I left out the pockets and sleeve tabs because they don't sit well in Jersey. Great dress Jo. You amaze me! You are a talent, Jo. And a great model. It is perfect - comfortable but also very smart looking!